WATCH SOFTPRO WATER SOFTENER VIDEO BELOW TO LEARN ABOUT US AND THE SYSTEMS. VERY INFORMATIVE AND A MUST WATCH SO YOU CAN MAKE THE PROPER CHOICE. What is Upflow Regeneration & Why is it Important? 1. Upflow regeneration allows for a more precise recharge of the resin allowing the system to only recharge the depleted resin. 2. Upflow regeneration drives hardness away from the resin to the drain. 3. Downflow regeneration forces untreated water through the now cleaned and recharged resin. 4. If the upflow water softeners drops below 3% a short regeneration will restore the system to get through the rest of the day until system regenerates at its scheduled time. 5. The SoftPro® Upflow Technology reduces salt waste by as much as 75% & water waste by 64%. Why SoftPro by Quality Water Treatment over others. There are a lot of places to buy water softeners but, no one knows water softeners better than Quality Water Treatment. Quality Water Treatment is an established full-service water treatment company since 1990. We are a family owned and operated so when you contact us you are always dealing with one of the owners that has a vested interest in making sure you get the best service and quality possible. We are always here to assist you before and after your purchase. *Proportional Brining to save you on Salt usage and waste water! *Brine tank includes Brine line, brine grid to keep salt from binding up on the bottom of the tank, and Safety float with Brine well. * Water softeners up to 48,000-grain capacity ship loaded with resin saving you time and money on the installation of the system. PRODUCT TECH SUPPORT - SoftPro is taking over as the best! Made using the highest end components and hand assembled! Experience the difference and see why we are the industry leader. Email, Phone, Text support along with YouTube videos give you SUPPORT for before, during or after the installation. VALUE ADDED PACKAGE - We pride ourselves in simplifying the consumer experience. We demonstrate this by PRE-LOADING the mineral tanks with resin for you to reduce heavy lifting and mess, we provide additional INSTALL ITEMS to save you from making extra trips to store, and we are very EASY TO CONTACT using phone, email, and texting! Compare to the Fleck5600SXT but with less Salt and Wastewater usage and a better warranty! SoftPro Pura Overview - 3/4" valve compares directly to the fleck 5600sxt! SoftPro Pura Optimus is an upflow high-efficiency water softener that saves you up to 75% on salt and 64% on water every regeneration compared to the standard down flow water softeners such as Fleck and Clack. SOFTPRO IS A WATER SOFTENER THAT PAYS FOR ITSELF. Better warranty! - SoftPro Pura carries a better warranty than the Fleck 5600sxt. The Pura warranty is 7 years on the valve and lifetime on the tanks! Better Brine tank! - large 18x33 brine tank so you don't have to add salt as often! Brine tank includes a salt grid to keep the salt from bonding together at the bottom of the salt tank! Step up with the SoftPro Elite Basic! SoftPro Elite Basic Overview - Still save 75% on salt usage and 64% on Wastewater but get added features! The softpro Elite basic control Valve is top of the line! Large 4 line Touchpad LCD display. No confusing symbols or codes. Reverse Flow Regeneration preserves unused softening bed from an unnecessary exchange, therefore saving salt. The SoftPro® Elite Basic design is a full 1” ported system throughout making it the best maximum flow water softener available. Top of the line Control Valve - Large 4 line Touchpad LCD display. No confusing symbols or codes. UPGRADED Resin- 10% Cross-linked resin for longer life. 10% Crosslink resin is more chlorine resistant and has a stronger bond so it lasts longer! Automatic System Refresh flushes stagnant water after 7 days of non-use, preventing bacterial growth. Automatic Reserve - adjusts based on your actual usage. Automatic Backwash Variable - Preset for clean municipal water by matching backwash frequency to water quality needs saving you hundreds to thousands of gallons of water annually. Soft Water - Brine Tank Refill keeps the brine tank and injectors cleaner. Black Neoprene jacket - Black Neoprene Tank jacket to provide insulation to the tank in high humidity areas keeping it from sweating and protecting it in colder weather. SoftPro Elite Plus Overview - The Softpro® Elite Plus water softeners use up to 75% less salt than the traditional down flow water softeners but with added features. The softpro Elite basic control Valve is top of the line! Large 4 line Touchpad LCD display. No confusing symbols or codes. Reverse Flow Regeneration preserves unused softening bed from an unnecessary exchange, therefore saving salt. The SoftPro® Elite Basic design is a full 1” ported system throughout making it the best maximum flow water softener available. We have utilized a media guard 55 for city water to remove unwanted chlorine, lead and other heavy metals giving you good tasting water throughout the whole house Equals No chlorine in the shower. Whole House sulfur filtration! - kdf 85 for well water, removes heavy metals, up to 2 ppm of Sulfur, and is bacteria static meaning it keeps bacteria from growing in the water softener. Get the best water with this complete filtration set up! Ultimate Package Overview- Get salt and wastewater savings with the softpro Elite Basic model water softener! The softpro Elite basic control Valve is top of the line! Large 4 line Touchpad LCD display. No confusing symbols or codes. Reverse Flow Regeneration preserves unused softening bed from an unnecessary exchange, therefore saving salt. The SoftPro® Elite Basic design is a full 1” ported system throughout making it the best maximum flow water softener available. Get the best water throughout the whole house with an added upflow carbon filter and great drinking water with a high-efficiency low waste reverse osmosis! Whole House Upflow Carbon Filter to provide better smelling and tasting water throughout the home! 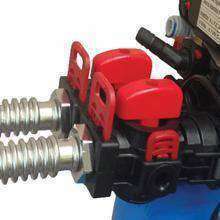 This system requires no electricity and no drain making them very easy to install because there are only in/out ports! Very cost effective Non-Backwashing carbon filter uses catalytic carbon and works well in city water applications to remove Chlorine, chloramines, Pesticides, Herbicides, heavy metals, and volatile organic chemicals. Whole House System | High Flow & Complete Filtration! Upflow tank for better filtration, no backwashing, no electricity, and no waste water! 18 x 33 brine tank, Includes; Salt Grid, Brine line, and Safety float with brine well. 18 x 33 " brine tank, Includes; Brine line and Safety float with brine well. Great water softener. Had to redo some plumbing from my old softener which took longer than installation of the Soft Pro. It was easy to install and programming was straight forward. Had one question about unit installation and called customer service and Left a message. Jeremy got right back to me and answered my question. Have had it installed almost a month now and loving it. Thank you Quality Water Treatment for a great product and customer support. Would highly recommend Quality Water Treatment for your go to water solutions. I feel like I have received a quality product for a good price. Any questions I had, was quickly replied to via the FB messenger app. The Soft Pro Elite was a difference maker on day 1. I could not be happier! Second one I installed. Earlier one was a similar model. Both installed with minimal trouble, 1st one via CPVC and 2nd via copper. It would be great if softeners could be standardized for quick installation, inlet/outlet position & spacing and height. The process of deciding which water softener to purchase was confusing because of the hard water (13 GPG) that the city supplied. After looking at the non-salt options that I found would not be an efficient option. Upon reviewing the salt options, I came across Quality Water Treatment. They had two options I was interested in. I had already researched the different resin types, the 8%, 10% and the SST-60 resin pros and cons. After having a good idea what softener would work best for me, I contacted Quality Water Treatments by live chat and messaged with Heather in reference to questions I was not clear on. Heather was very helpful and answered all of my questions. I researched all of my options and after a few days I was down to two options, Quality Water Treatment carried both. I sent a request for more information on the differences of two units. The next day I received a phone call from Jeremy and while on the phone with Jeremy Heather also called and left a message. That showed that the customer service, sales were on it. Jeremy took the time to answer all of my questions, he did not push one unit over the other. I again read more reviews on both units and finally made a decision. My neighbor was also interested in a water softener and was relying on me to make a good decision as he was going to purchase the same unit. I went with the SoftPro unit with the flex connectors. Jeremy was helpful in choosing the right size unit. Upon receiving the softener Jeremy was great in answering any installation questions I had from setup to completion. The setup instructions provided by Quality Water Treatment were very easy to understand and made for an easy setup. I found that the customer service at Quality Water Treatment was great! If I had a question, even late in the day I would get a call back even if it was after 5:00 PM Mountain time. Thank you, Jeremy and Heather, for all your help!!!! Found QWT in researching water systems online. Everything seemed positive- quality products, competitive prices, seemingly good tech support and to boot was family-owned. With a call to Jeremy I was convinced I would purchase my Fleck system here. In analyzing our situation, he downsized what I thought were our initial requirements not trying to push higher capacity systems. And in the end, after several more calls to Heather, chose a Softpro softener. The 2 cartons arrived, the resin tank box roughed up in transit, and effortlessly set it up. Since the system is newly energized I can't yet give it a 5 star, but will after a few more months of operation. Enjoying our soft water from a very hard Texas well. Very easy installation. Worked as advertised. Just put it in Saturday. No issues during install. Just need to get it dialed in. Thanks for your help. Softener arrived and was just as described. Very pleased. Great product, had to have it installed by a certified plumber who took about three hours to set it up. It's much bigger than my need but the price was great and reviews were excellent, so I went with it. The water softner order was quickly filled and shipped to my home. It arrived in excellent condition with all components and resin needed to make the softner functional. Instructions were clear. Thanks for your continued support. I almost feel I can handle anything on this unit, and see how really simple the technology is. We had a very expensive "leased" system prior that was "horse and buggy" compared to this system. It works great! We have only had it installed a couple of weeks, but it works great! My Dad and I installed it ourselves (not professionals), and it is as easy as it seems. I ordered this on a Saturday and it showed up on Wednesday. I’ve never done this before and had it installed and working in about 3 hours. It took a few cycles to get the water soft but after that it works great. I really couldn’t be happier with it. I am a middle age woman and was able to install all by myself. The instructions are easy to read and the company is always pleasant and ready to help with questions. We love our system. I highly recommend the system. Very easy to install, great unit! The water softner has been in service for two weeks and so far we love it. Good softener, good service. I will introduce to my friend. This past fall, we had a hard time with our smart washing machine and it was not doing a good job processing and it takes an hour and a half to do one load of wash and even then it still wasn�t good enough. I felt like the water quality we must�ve been receiving for the house from the city water wasn�t really good. So, we bought all new appliances and that led me on a crazy hunt to find better water for our house. That�s when I started researching water softeners and I came across the water softener from Quality Water Treatment. They were a modern pop kind of shop and that led me to them. They were an independent company versus somebody like Home Depot or Sears. I knew that going with a smaller company you�re going to get that better experience with them as far as customer support. Also, the cost of it was really competitive versus the other makes and models. Quality Water seemed like they were a real quality company because when I called, I spoke with Heather, and then the next time I called I spoke with Jeremy, and then when I called again for questions about the water softener or questions about the installation I kept getting those two. I quickly realized when I said modern pop that�s really exactly what I�m getting. I�m getting one family and it�s a great experience between both of them. When I had the system installed, you�d call it slimy feeling having no hard water. So, that made me very happy and with the brand new dishwasher, washer and dryer, everything has been coming out nice and clean, and no problems with the dishes, and the washing machine taking an hour and a half just to get things washed. I�ve been very happy with the quality of the water. My old softener which I purchased from Quality Water Systems started to fail. I had a good experience with them when I bought it 16 years ago so I decided to go back to them and buy an Aqua Pure single water softening system. It was easy to order through the internet and it was delivered in a short time. When I had a question a couple of times, I solved it by going on the internet and using the chat feature. The value for the price is as good as any of the big-box stores or any of the other places that work so, overall it was a good experience. Plus, it's back to producing soft water again as it should so everything is working fine and I�ve recommended them to several people. We got pretty hard water up here in Minnesota so I ordered a water softener from Quality Water Treatment online. Their reps were good and the website was pretty easy to get through. I bought one from them before and I thought it was time to upgrade. I installed the old system, but the new one is still downstairs and I haven't put it in yet. Works great! Love the simplicity! I decided to replace a 10 + year old culigan that was not working. I did quite a bit of research and came to the conclusion that kinetco is one of the best on the market, but.... cost a lot. I had them and 1 other come out and give me a price and test the water. I was very impressed but could not get myself to spend that kind of money. I then started to research other units. I found that no one would compare themselves to kinetco until I came across the softpro brand. Very impressed! Working great! Saved a bunch of money buying here rather than buying local. Speedy delivery, easy to install and it works better than any other water softener that I have owned. We needed a water softener since we were having issues. I researched on the internet and Quality Water seemed to have the information I was looking for, for the price and the features that�s why I went with them. I just filled out the form online and they shipped it to my home, and I installed it. The water is now soft after installation. This is our third softener and second SoftPro. We have always had great, consistent, and trouble free service from our SoftPro softeners. SoftPro is the only brand we truly trust. I have installed this system myself and used it for several months and it works great as advertised! This was better than I expected and top of the line product! We have hard water in our area, which ruins plumbing and fixtures. My neighbor, who's a knowledgeable person and an engineer, has the system of Quality Water Treatment and he knew it was a good system so I decided to get the same one. He sent me over the links and I ordered it online. I got it installed and running last Saturday. I'd recommend it. Great Softner, water tastes soooo good and feels great in the shower. This is my first W S. I had it installed by a plumber and its been working just fine. I've had the unit up for a month now, replacing my more expensive softener, and everything is working just fine. In fact this product does a better job softening the water than my old, more expensive unit. I hired a professional plumber to plumb in the unit and programmed everything myself; it's a piece of cake. Works really really well. Great price too. I bought a water softener from Quality Water Treatment because my previous one was too old that I needed to replace it. I have used them before and they had a good price and it was a good product. I've been very satisfied at this point and it�s working well. I'd recommend Quality Water Treatment. They got good products for a good price. I'm highly impressed with the service provided by Quality Water Treatment, and with the quality of the SoftPro product. Great pairing! Installed this myself and it has been working great for several months now. Its only been a short time but the water softner is working great for a family of 5, no problems! More than my love for this great product is the awesome customer service they provide. The installation was very easy and the water softener is working like a champ. Works very well and the company is very attentive to make sure that is the case! I looked at few different softener brands including the known brands and this one softpro has the same spec and its is $700 vs $4500 kinetico that they wanted to charge me to have one installed at my house plus softpro has good warranty as well. Works great, easy install if you have some home plumbing repair experience. I did have questions during installation and called customer support, they were able to answer my questions fast and were very friendly. Great product. Great instructions and easy to install. Phenomenal water softener. Great product, great price. Good price. Arrived on schedule. Easy to install. Works great! Installation went smoothly. All seems to be working well after several weeks. Easy to install. Works very well. It has been several months that I have been using this system. We are extremely happy with it. The system works as advertised. Started with extreme hardness. Ended up with virtually none. Easy to install. Fast, friendly, knowledgable help. I'm still reviewing this, but so far it's holding up pretty nicely. Definitely worth it compared of other costly options. Works great, easy to setup. I love the softwater. Bought this softener to replace the old one that came with the house. Made a complete difference in quality of water. The Sulfur smell went away 100% and I see less rust in my toilets. This setup was easy to install! Great product. Have had installed only 3 weeks but no issues. Highly recommended as a product from a highly recommended seller! This is a really nice product so far. We have only been using it for a week but my hair already feels silky again and the soap does work better as noted in other reviews. Love this water softener. Just had bought a new home and found out the water softener there didnt work. After much research, this one was found to be of best value; not only cause of the price was on the cheaper side but the quality was on the high end side. Others wanted double the price for similar or less quality. Love the feel of the water now and hasn't let me down yet. Well worth the money, in fact was cheaper than any I could have bought locally. Would recommend. Good product, produces very soft water. Saved us 2 grand. Thank you. Easy to install. Once you watch the videos, installation is easy to follow. It works great. We have VERY hard water and a few days after installing the tests show very soft water. The unit works exactly as described. Our water is now very soft and we are extremely happy. Thank you for a great product & support. Easy setup and GREAT customer support. This saved us several hundred dollars by purchasing online. It arrived on time and in perfect condition. We had such wonderful help from Jeremy, always there for us trying to solve our problem with too much color in the water. He was so helpful, so willing to find out on the problem. He even called us to see how it was going. Such wonderful service, you have a great guy working there. A keeper. The existing water softener I had quit working so it was time for a replacement. I was researching water softeners and found Quality Water Treatment, and their product matched the existing unit that I had. The Quality Water team was great. They messed up the order and sent me the wrong unit so I called them back and they sent me the correct unit after a couple of days. I shipped back the wrong unit that they�d sent me and everything went perfectly. It was a smooth transaction. I put the majority of the unit together based off some tutorial that I saw online. And then there was one copper line that had to be shortened a little bit so I had a heating and cooling guy do the final installation. Since having the Quality water softener, our water has gone back to the way it was prior when the old system was working. We live in a place with very hard water and a softener went to the top of the priority list for our home. Preserving our appliances is the number one reason why we got the softener. I was making repairs in the new home and my wife was trying to give my little daughter a bath and the handle just stripped off because of the hardness. Our appliances were deteriorating quickly and so, I knew I needed one. And also, back in my head, I always knew it started burning our bill because the water heater is filling up. Now, my appliances are better. When I think of Quality Water, I think of mainly competitive pricing. It�s what keeps me calling on them. The sales agents met my expectations. My first purchase was back in 2014. We got SP64 Soft Pro, Water Systems Elite, Metered On Demand water softener. My friends also asked my help with buying softeners as they�re not the most technical about it. I got confused with the latest install so I had to call Quality Water Treatment and they were quick to answer and they also quickly gave materials that I could review that clarified things. During a phone call, they're responsive and emailed me with appropriate information but I wouldn�t be able to navigate their online site myself. I had conditioning problems in my house and had professionals come in. They gave me outrageous pricing. But I thought I can do it myself if I have a little guidance. So, I bought the components from Quality Water Treatment and did it myself. I got a UV light, a conditioner and chemicals for the conditioner. Everything was online. I talked to the owner's daughter and she's very professional, answered all my questions and fulfilled my order. They were reasonably priced and they produced the products when they promised they would. The products work very well. It�s perfect, and I would refer them to other people. Our area is known for high contents of calcium so the water is very hard. We bought SoftPro Elite from Quality Water Treatment. They had a reasonable price and I could do the work myself. I talked to the sales manager who answered a few questions I had about the product and he wanted to take my order over the phone but I said I'd do it online. I was actually surprised because I ordered the wrong thing and he proactively called and fixed it. I recommend Quality Water. I got the whole water system from Quality Water Treatment. It was an easy call since I'm on a well on where I live and every one of my appliances, refrigerator, washing machine and iron, the water was a 16 for hardness. The people I talked with cared and showed that my business meant something. The sales guy was very knowledgeable and I told him what I was up against and he suggested a particular system which was the simplest to install. It's a little bit more of money. But, since I was saving the labor fee, and I couldn't get anybody to do it anyway, the extra money became irrelevant to me as it was 60 bucks extra. I installed the system myself since I live on an island and getting plumbers and electricians over here is next to impossible. I had to get a system that didn't require a lot of extra knowledge to hook up. Especially the programming, since I'm old and I'm not knowledgeable when it comes to software and the system only had to do two things. It was an easy DIY thing. I had to watch their video and other videos since the system itself is straightforward in hooking up. The difficulty that I was faced with was how to hold and hook it up to my house. I had to watch other plumbing videos and the result isn't pretty but it works. As it turns out, I'm just learning how to do it. But, if people are willing to do all research, they can do just about anything at home. If they watch enough YouTube, they can figure it out as it is helpful. While I was hooking the system, I had to make a phone call to one of their people. Even though it was simple as it was, I still had a question about the programming and the guy was right there helping me. So I'm fine now and I'm pleased. I'd recommend Quality Water Treatment to others. I assume the system is going to perform as advertised. I've had their system for eight months already and it made a huge difference with the water we have now. It was a very good experience overall. I moved from Connecticut to Arizona a year ago and the water here was terrible. We couldn't drink it and can't do anything, and when I spoke to some of the neighbors, they said they need to put up a water softener system in. So I did some research and ordered a system from Quality Water Treatment online and installed it myself. The water is much softer now, it soaps up easier, and it doesn't leave water spots in the dishwasher when you're washing the dishes. The parts on my old water softener had disintegrated in the chlorine, so it was leaking and wasn't working anymore. I needed a new one and got it from Quality Water Treatment. I ordered everything online and the people that I talked to were based in California. I spoke to a gentleman and a lady, and both of them were helpful and willing to spend time answering questions. They made sure that I had the right product and the right size. The water softener that I bought was a big improvement over the old one that I had since this one was on-demand while the old one was on a meter. So, the old one would be running more often than I needed it to and since it was always functioning, it would sometimes lead to the water being salty. With the one we have now, the water is perfect, it's soft and it's exactly the way we wanted. Plus, the water softener uses a lot less salt, less water and is more efficient.